Protein assembly follows linguistic rules, and the combination of linguistic analysis and the use of modular units as building blocks are now beginning to allow first insights into the underlying parameters for the evolution of multidomain proteins. Filaments of the cytoskeleton systems, themselves assembled from modular protein units, display the hallmarks of self-replicating von Neumann automata. The actin cytoskeleton is a prototype for a molecular code that is generated by the assembly of identical subunits, and cells are able to respond to changes in the state of the cytoskeleton. Thus, cytoskeleton assembly generates signs whose purpose is to provide the necessary asymmetry for molecular interactions and that makes organic meaning accessible. The cytoskeleton acts as a code maker, and functions as an internalized, shared background knowledge of a historically evolved linguistic community. It is a modular, universal, and dynamic structure that employs adapters to interact with intracellular and extracellular entities, and it is a molecular machine that engages in biosemiosis via a continuous assembly and disassembly cycle. 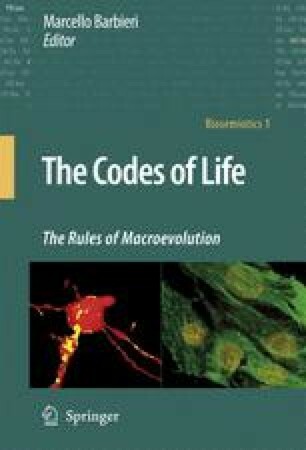 In this chapter I will discuss how the rules and parameters of protein linguistic assembly, and in particular the cytoskeleton code, reveal a cellular biosemiotic mechanism at work.